I was the lucky winner of a contest held by TopWebComics.com at the end of March. The prize? An iPad!!! This video is my thank you to Richard from TWC, and it's also a chance for me to show off Super Haters on the iPad, not to mention Time Log on the Kindle app (which I obviously don't know how to use very well). Plus, there's a little peak at the AudioShocker Comics Archives v1 digital comic card. Oh, hey, while you're at it, you should go vote for Super Haters on TWC! Tags: Comic Cards, digital comic cards, Super Haters, Time Log, Wanna see my Nick? It's been a while since I've done an update like this and there's a lot to cover, so let's get to it! - The image you see up top is the art for the very first AudioShocker Comics Dropcard. Confused? Dropcards are essentially little gift card looking things that give you a unique code to access downloadable content. They're pretty common nowadays for musicians, but as far as I know, I'm the first person using them for comics. The Dropcard pictured above will make its debut at this year's SPACE. 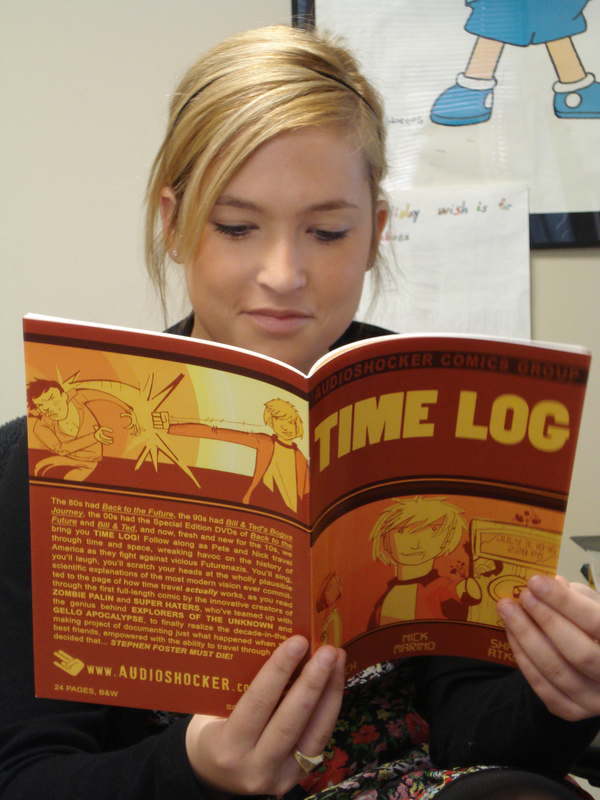 - The New Time Log (1 of 3), which is currently at the printers! It's my first foray into full color printing and it's a bit ironic considering I'm pretty against expensive, over-printed comics... But this bad boy is one high-quality sucker! Smooth paper, lush tones, and-- oh look at me, I'm gushing. Anyway, I'll be posting more about this book in the next few weeks. - Speaking of new comics, I'm a contributor to Andy Scott's comix anthology, specifically Andromeda #7. I have a two-pager in there called "Adventure 101." Click the linked issue title to check it out on Etsy. - And continuing the theme of collaboration, over on my daily webcomic, Super Haters, I'm gearing up for a new feature -- Super Haters Guest Weeks!!! Each month, beginning on the second Monday, I'll be featuring seven days of strips by a guest writer. First up in March is Ross Campbell, who's got some pretty nuts stuff planned for Destruct-O-Tron and Mind's Eye. - I also have a ton of other stuff going on, like an upcoming talk at the Out of Gutter comics discussion group at Pittsburgh's Carnegie Library in Oakland, the bi-monthly Sequential Underground podcasts, Time Log nearing the end of ACT II, Project Basement (v3 starts later today (Powers and Costumes this time around)), and... this brief 24 Hour Comics Day 2010 interview that I did with the TGT Webcomics Podcast (my section of the interview starts at 28:20). Buy your own from Amazon or DriveThruComics!!! The Time Log webcomic begins! 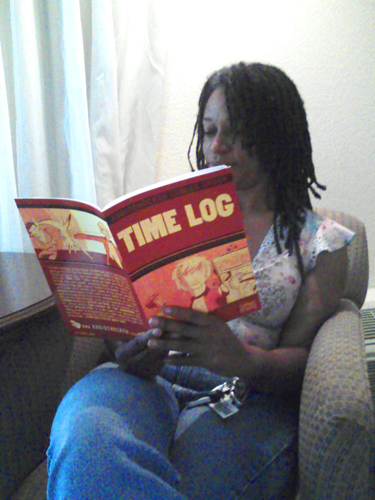 As a follow-up to the Time Log one-shot comic I released this spring, I'm doing a Time Log webcomic with Pete Borrebach, Shawn Atkins, Paige Shoemaker, and Justique Woolridge. The first installment of new material debuted today, so check it out! 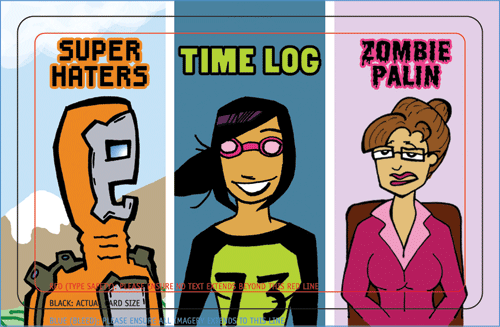 Posted in Comics | Comments Off on The Time Log webcomic begins! So go buy a copy already!! !